Nick Vujicic. This man is INCREDIBLE! thanks for turning me onto this bob! My pleasure, Tim. 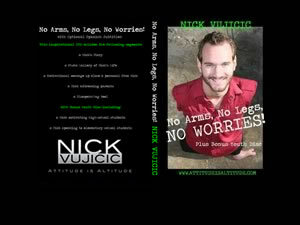 I’m very impressed with Nick Vujicic. He has a great message, and he’s a powerful speaker. Plus it’s heart-warming to see his rapport with the students he speaks to. This guy sounds great. I went to his website- do you know what he costs for schools? I shot an email to the website, but just thought I would ask. We get speakers here all the time, but have a small budget because we have so many speakers.. Just curious.. I don’t know how much he costs actually. But I imagine if his fee was over your budget that a few schools could chip in together to have them speak to all at once, or on the same day.